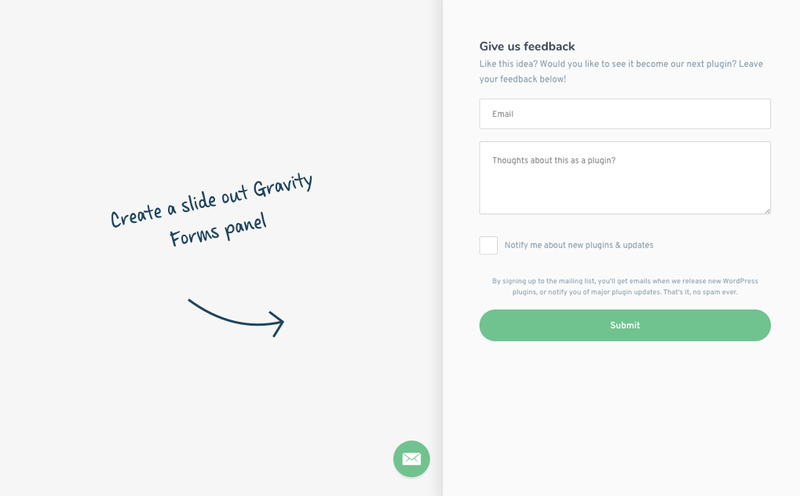 Expanding from our previous example on How to create a fixed floating form widget, we’ve re-worked and re-jigged this idea to display your Gravity Forms in hidden side panels that pop out on activation. Add the below HTML markup to the page/post/ or global area in your theme. Tip, if you don’t have access to edit your theme PHP files, I suggest adding this markup in any global area across your website. Things like a footer widget or header widget will work well. Basically anywhere that appears on every page. I’ve added my HTML to the bottom of this post within the WordPress text editor. See below. Copy the below CSS styles and add them to your WordPress theme. If you don’t have access to your WordPress theme I suggest installing the Simple Custom CSS plugin and then copying the below CSS into the settings screen. This plugin will allow you to add custom CSS to your site. Should look like this once done. Copy the below jQuery and add it into a HTML field within your contact form. See screenshot below. Add the JS to a HTML field, should look like below. Take a look at the bottom right-hand side of this post, you should see a floating green mail icon, click that to see the form appear in the widget panel. Grab all the HTML, CSS and JS snippets you need to add this effect to your forms on your website. We’d love to see you try this on your own website! 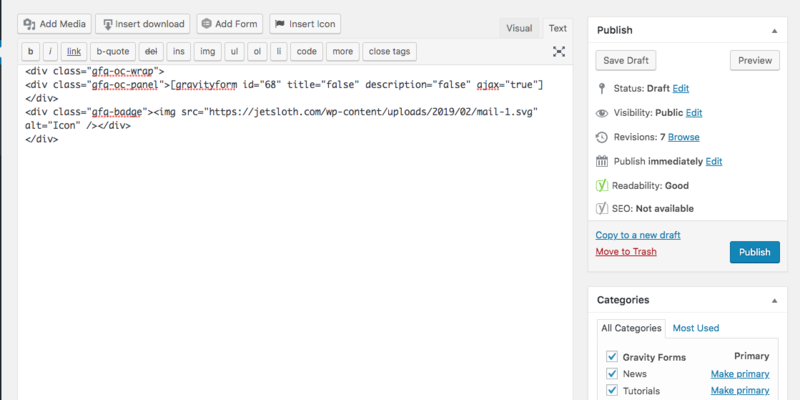 Even more, we’re potentially looking at turning this idea into a larger plugin that would be available on JetSloth. So with that in mind, we’d love to get your feedback on the idea, do you love it, hate it, or have some feature requests. Click the green icon example and leave us your feedback about this idea in the widget form on page. 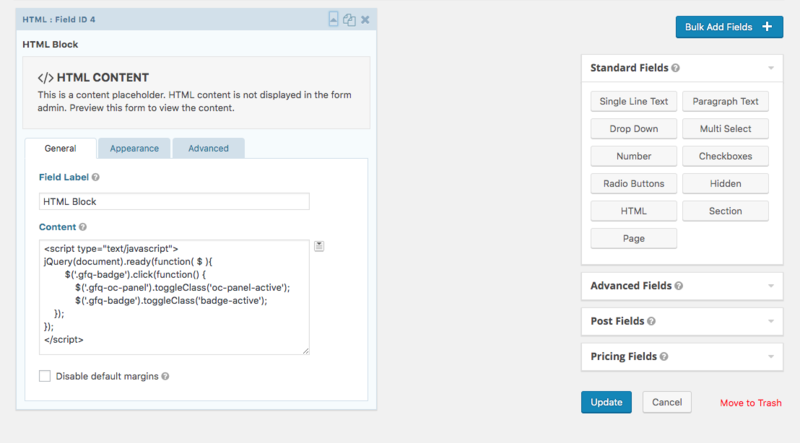 Checkout our first article on How to create a fixed floating form widget, See demo below! Like this idea? Would you like to see it become our next plugin? Leave your feedback below! By signing up to the mailing list, you'll get emails when we release new WordPress plugins, or notify you of major plugin updates. That's it, no spam ever.